This may not be a fully fleshed out review, but I thought it'd be fun to try some different flavors of Salt Water Taffy that I picked up during my last day trip to the shore. Pink & Yellow (Bay Breeze) - Very tropical and pineapple heavy. 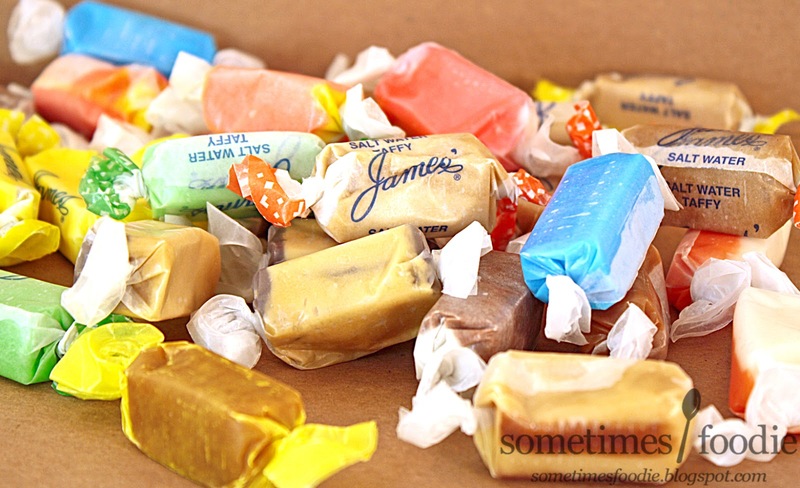 The flavoring is pretty bold and fruity, as far as salt water taffy is concerned, and it's really refreshing. I liked this one quite a bit! Yellow & White (Pina Colada) - Not as sharply acidic as the pineapple in the bay breeze version, but it's still there, mixed with a sweet and mild coconut. 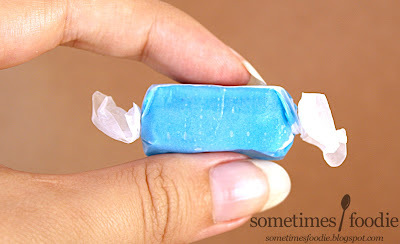 Another really delicious tropical taffy flavor, but I liked the Bay Breeze more. Green with Green Tails (Lime) - Smells tangy and zesty, like the lime fruit flavored Tootsie Rolls, only better. 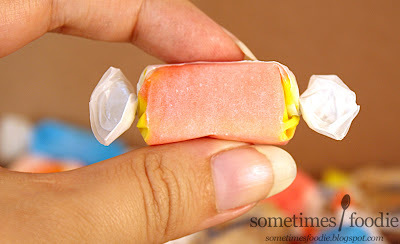 This one is really zesty and tangy, and it leaves my mouth feeling much more refreshed than any of the other flavors. It almost has a palette cleansing properly to it. Blue with Dark Blue Stripes (Blueberry) - Oh god, what is this? I immediately regret buying this one. It's hard to even describe what this one tastes like. It smells mildly...blue. Like generic blue candies and blue raspberry sweets, but very very mild. I started chewing, and it starts out tasting like nothing, but the more you chew the more floral it gets and it's just...awful. This is not good, and I can't see that many people buying it. Sure, it's a pretty color, but that's the only positive thing I have to say about it. Yellow with Yellow Tails (Lemon) - Pleasant and mild, no where near as strong as the lime version, this is more like a light touch of lemon curd with a huge pile of meringue. I like it, but the lime is much zestier and interesting. Light Brown with a Brown Stripe (Cookie Dough) - Smells caramel-like, this one has some vanilla, caramel, and molasses notes, but I can't say it tastes like real cookie dough. It's interesting, and very very sweet, but I can't see myself buying this flavor again. Tan with Purple (PB & J) - It smells like peanut butter and grape cough syrup...so there's that. 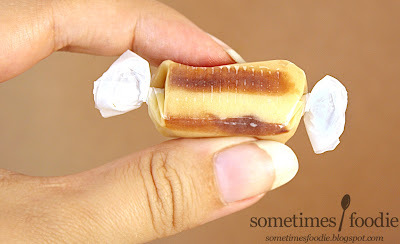 I took a bite, and the peanut taffy is pretty great, but that grape...dear god. The peanut butter part is so soft and flavorful, and a little gritty, but it's all lost in a sea of artificial grape cough syrup flavoring. I think it was trying for concord grape jelly, but this? This is not it. After one bite, I didn't want to finish the single piece I opened, and I have several of these left. Brown with White Stripes (Cookies & Creme) - Very Tootsie-roll like. I imagine if I took a classic roll and ate it with a vanilla one, it'd taste just like this. It's okay. The finish is a little like a chocolate flavored cosmetic or Chapstick, but it's not awful. I'm happy I only have one or two of these.